A new destination among the most popular with casino operators in Europe, Bucharest has some of the most beautiful and largest casinos in Eastern Europe. Among these is the Grand Casino Bucharest , a superb place dedicated to casino games and open to both actual visitors and online players registered in certain virtual casinos. Live Dealers Casino brings you more on this Romanian land based casino now accessible on the web. The Grand Casino Bucharest is situated on the ground floor in one of Romania’s largest hotels. It’s in the JWMarriott Hotle, a 5 star complex situated in one of the Romanian capital’s most upmarket areas. In this luxurious, chic environment visitors from all over are welcomed to the casino. It’s linked to the many ameneties on offer in this vast hotel complex which has 402 hotel rooms and 23 high class suites. A swimming pool, sauna, gym and restaurants are also on offer. The Grand Casino Bucharest offers its players quite a varied range including twenty slot machines and 22 gaming tables (American Roulette, Poker and Blackjack). Classic table games are important here. The games are hosted by a team of professional dealers who follow international rules. The Grand Casino Bucharest is open every day 24/7. From 2016 onwards , the team managing this prestigious casino decided to get involved in live gaming. The first step was to sign a partnership with the developer Evolution Gaming to install the first certified studios in Romania to stream games live. Opened in September 2016, these studios now supply 8 local online casino operators. Then in mid-2017, Evolution Gaming moved up a gear by launching its Grand Casino Bucharest’s live roulette table whose games games take place live at one of the casino’s tables. Thanks to the Riga developer’s ingenuity, virtual players can play exactly like actual visitors to the casino and experience the atmosphere there. 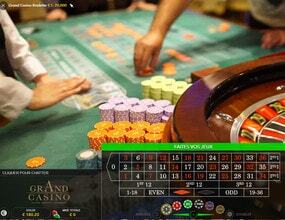 Online players can play roulette live from the Grand Casino Bucharest. They place their bets on the green roulette mat at the same time as the players present in the casino. More over, this table is suitable for beginner and experienced players. The levels of the bets mean that all types of players can play at this roulette table filmed by HD cameras. The streaming is very rapid and the HD images are amazing. Through Evolution Gaming, the Grand Casino Bucharest is linked to several well known platforms in the igaming industry such as Lucky31 Casino, Casino Extra and Dublinbet. In the live dealers section of these online casinos, one can find almost all the Riga based developer’s creations including Dragonara Roulette, and the Grand Casino Bucharest Roulette. This is without even counting the other roulette tables from Authentic Gaming, Ezugi and LyveGame from other real casinos. With more than 150 live dealer tables (in any of the online casinos mentioned previously) you can experience the excitement of land based casinos from the comfort of your own sofa.